The fear of carbs often surfaces among new vegans. Carbs may be considered "fattening", but that actually isn't the case. Why are people so afraid of carbs? Popular high-protein, low-carb diets, such as Atkins and Paleo, encourage people to ban carbs. These diets are controversial, as they are rich in meat, eggs and high-fat dairy and thus may have deleterious health effects. Simple sugars: found in sweets (cakes, cookies, ice creams, candy and so on), soft drinks and fruits. Complex, low-fiber carbohydrates: found in refined grains such as white bread, white rice, breakfast cereals and so on. 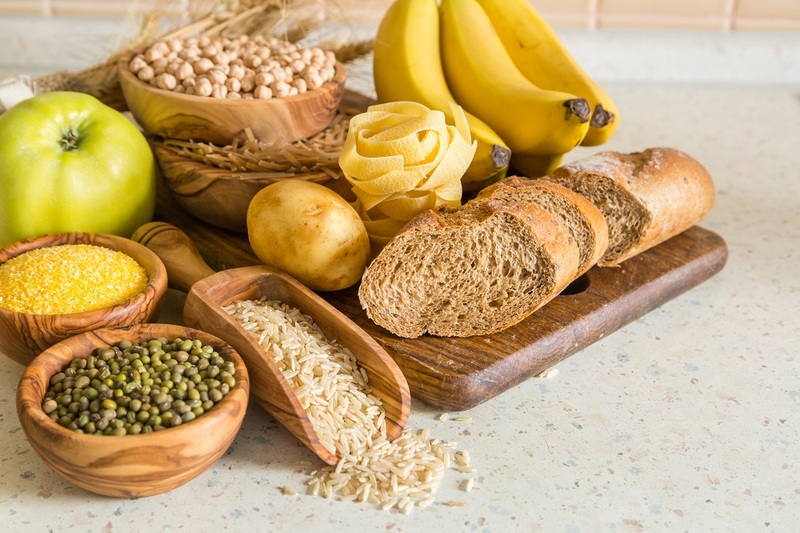 Complex, high-fiber carbohydrates: Found in whole grains and legumes. It is strongly recommended to base your carbohydrate intake on the third group and to limit your intake from the two first groups. But aren't carbs more fattening than protein? Nope. Both carbohydrates and protein contain 4 calories per gram, while fat contains 9 calories per gram. So why do some people say carbs caused them to gain weight? They eat the wrong kind of carbs (as mentioned above), which may also be accompanied by lots of fats (in snacks, pastries and fries). They forget to add protein to their diet, and therefore may not feel full, thus tending to eat more. What is the solution, you ask? Eating good carbs throughout the day and making sure to eat protein-rich food such as legumes, soy and soy products, quinoa, seitan and a moderate amount of nuts and seeds. Generally speaking, what should a vegan who is looking to maintain or lose weight do? Up with the veggies: Eat plenty of vegetables throughout the day and fill half your plate with vegetables during your meals. Prefer whole, plant-based foods such as legumes, whole grains and vegetables. Consume nuts, seeds and nut butters and spreads in moderation. While they are very nutritious, they're also high in calories. Try to avoid processed foods and snacks as much as possible. Try to eat more home-cooked meals. If you're eating out, choose from the menu wisely. Prefer fresh, cooked or baked food over fried food. Snack on fruits: have 1-3 servings a day, between meals. Avoid drinking fruit juices and smoothies. Finally, the most important aspect of the weight loss process is the framework in which it is conducted. Whether it is with the guide of a dietitian or with a support group, find solution that works best for you.